Handheld guitar gods can now choose how they raise-up their band from the underground music scene to worldwide rock stardom in Guitar Hero On Tour: Modern Hits. Handheld guitar gods can now choose how they raise-up their band from the underground music scene to worldwide rock stardom in Guitar Hero On Tour: Modern Hits. 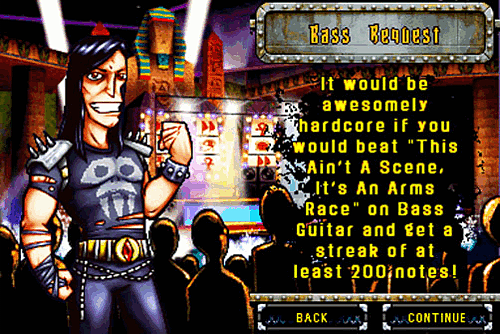 Featuring a set list comprised of 28 master tracks from influential artists including Coldplay, Fall Out Boy, Tenacious D, The Strokes and Weezer, Guitar Hero On Tour: Modern Hits expands on the innovative Guitar Hero gameplay on the Nintendo DS by introducing an all-new Fan Request system that challenges players to jam like never before. Fret board fanatics can once again unleash their inner rock stars anytime, anywhere as they hone their shredding skills and jam to face-melting modern rock tracks from the last five years in Guitar Hero On Tour: Modern Hits. Choose your path to stardom – For the first time ever, players can choose how they take their band from the underground music scene to worldwide rock stardom with the exciting non-linear gameplay progression in Guitar Hero On Tour: Modern Hits. 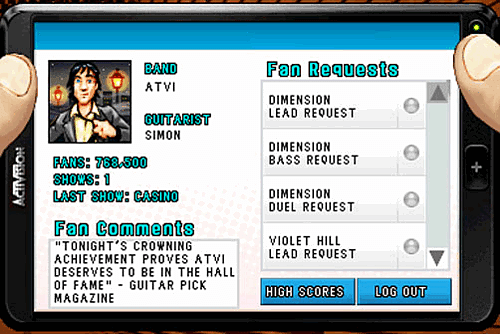 Do it for the fans – Guitar Hero On Tour: Modern Hits delivers an all-new gameplay experience with Fan Requests. By completing Fan Requests players build their fan base and open up new challenges to rock-out like never before including jamming to an entire song in Hyperspeed, battling it out in a Guitar Duel with active Bomb Notes or whammying every single hold note in a song. Rock out anytime, anywhere – Fans can take the Guitar Hero experience wherever they go with Guitar Hero On Tour: Modern Hits. The Guitar Hero Guitar Grip mimics a guitar fret board and fits seamlessly in people’s hands to deliver the same core gameplay that defines Guitar Hero. The party never stops – Song streaming features allow players of Guitar Hero On Tour: Modern Hits and its predecessors, Guitar Hero: On Tour and Guitar Hero On Tour: Decades, to share songs via local wireless connectivity. 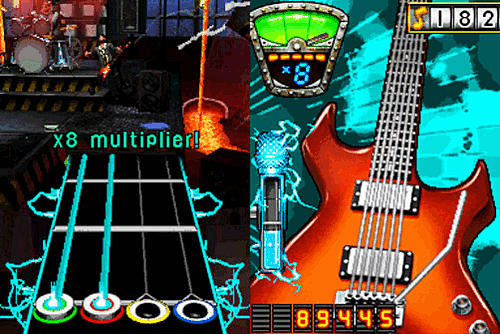 Players can rock out together in multiplayer modes, jamming to tracks from all three versions of the game. Please note: the DS Guitar Hero peripheral in this bundle is NOT compatible with the Nintendo DSi.